يشكل فندق Discovery Parks - Dubbo بموقعه الممتاز في منطقة ثقافة, سياحة ضمن المدينة، مكاناً ملائماً لقضاء العطلة بعيداً عن عجقة أيام العمل. يمكن من هنا للضيوف الاستمتاع بسهولة الوصول إلى كل ما تقدمه هذه المدينة النابضة بالحياة. يشكل هذا الفندق ملاذاَ مريحاً للاسترخاء ويمنح زواره فرصة للاستجمام والتجدد، وهو يقع على بعد خطوات من المعالم السياحية الكثيرة للمدينة. 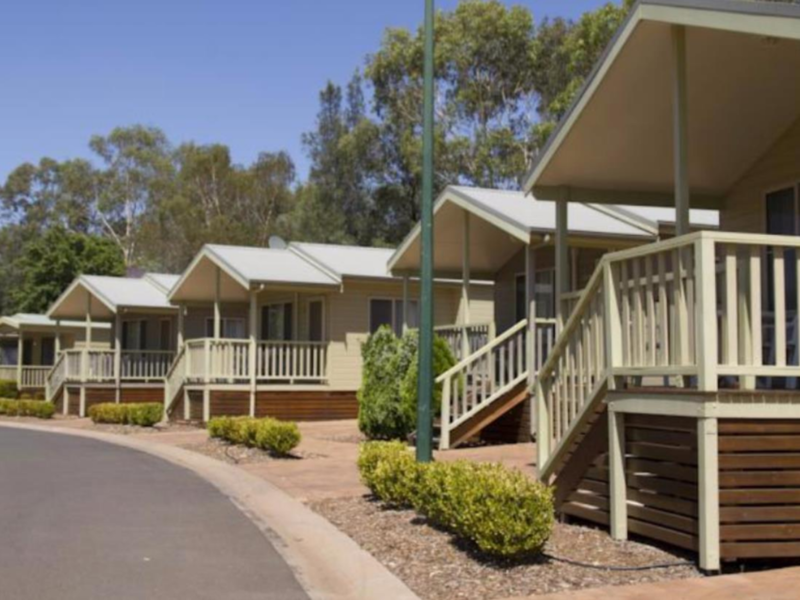 إن حسن الضيافة والخدمات الراقية التي تعرف بها Discovery Holiday Parks تغني تجربتك في Discovery Parks - Dubbo. يمكن للنزلاء الاستمتاع بالميزات التالية: واي فاي مجاني في جميع الغرف, واي فاي في المناطق العامة, صف السيارات, غرفة عائلية, مرافق للشواء أثناء إقامتهم في هذا المكان الرائع. تنعكس أجواء Discovery Parks - Dubbo في غرف الضيوف.إغلاق, تلفزيون بشاشة مسطحة, مرآة, بياضات, اتصال لاسلكي بالإنترنت هي بعض الميزات الموجود في العديد من الغرف. يقدم الفندق مجموعة واسعة من وسائل الراحة المتنوعة، كمثل: حمام سباحة خارجي, ملعب للأطفال, حديقة, غرفة ألعاب. استمتع بخدمات لا يعلى عليها وعنوان ذو اعتبار في Discovery Parks - Dubbo . On arrival the unit had just been cleaned so the floors were still wet and smelled like disinfectant. The main bedroom cupboard was used to store the cleaning equipment like the broom, mop and bucket so I definitely did not want to put my clothes in the same cupboard especially with the smell. The kitchen bench tops are in need of repairs as they are warped and outdated cheap timber covered with vinyl. The microwave oven has exposed rust so I was definitely not using that! The bathroom was in excellent condition as it is new although they did not have any mats and being winter one would expect it when stepping out of the shower onto tiled floors. We did not bother complaining to the reception as we were only there for two days and passing through but the pictures on the website were misleading as far as I'm concerned. 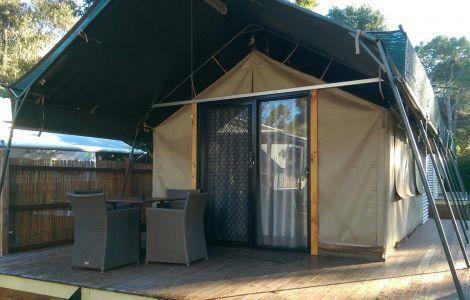 The location was perfect for us as we had stayed at Dubbo Zoo and were travelling further the following day. We really enjoyed our stay, the cabins were so warm and cosy which was great for our May stay. Good laundry facilities, free dvds and friendly staff. We would highly recommend Dubbo Discovery Parks. Great value for money with friendly welcoming staff. Adequate and clean accommodation, close to the zoo which was our reason for going. Only complaint is in this day and age a dishwasher, even half size would make all the difference when being away from home. We had the superior 2 bedroom unit which was comfortable for our 3 night stay. Despite having a cockroach, the unit was generally clean and tidy. 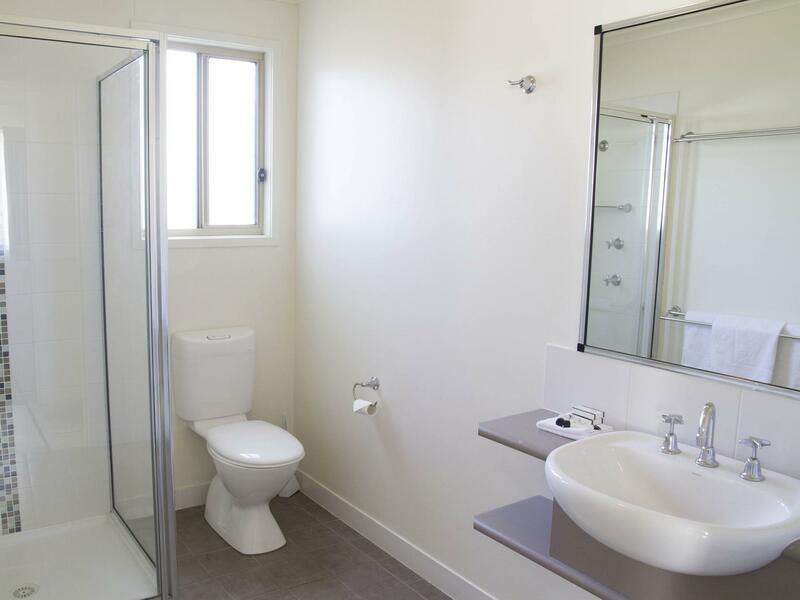 Also liked the separate toilet and shower room as it can get too crowded. Aircon was left on for us when checking it, so that was very kind, knowing the heat Dubbo experiences... Swimming pool was smaller than expected. It was a big holiday park with lots of families visiting so we didn’t find much space in pool as it was literally packed every single afternoon. The jumping pillow and playground was great to have too! In terms of school holiday activities, it was limited as there was only the one face painting on the afternoon we arrived. And there wasn’t daily activities so wished they had more variety of activities in the future. Great park, recommended! While the cabin was as well equipped as typical for discovery parks, Dubbo has some major drawbacks. It is further out of town than others - great for the zoo, but requires more effort for anything in the town. At least some of the park (including where we were) is in signal shadow for both mobile phone and TV signal, suppressing availability and reducing channel choice. The internet was not available and staff were unconcerned, offering no information or timeframe to repair. Instead they suggested going and piggybacking on a nearby club's signal. We were in the cabin nearest that club and had no such signal. Most significantly was the attempt on the afternoon of the second day to charge us for the cabin. I had presented the Agoda voucher (marked prepaid) on arrival, and staff were unconcerned, and did not state any issues with the payment. Instead we were rung 20 hours later, and just as the purpose for our visit was about to commence. The manager? (did not identify themselves) stated that no payment was received, the card details were repeatedly declined. When asked, someone else's card details were given to me. Even when I gave the booking reference, the only explanation I was given was 'they have problems with Agoda', but they were reluctant to call them - and it was suspicious I wouldn't just come up and pay! At this point I politely suggested they call Agoda and prepared to do the same. 1 phone call to Agoda services was sufficient and the matter was resolved - but I have travelled extensively in the Far East and never had to request this support before. Heaps of things to do for the kids, great family fun. This is the 3rd time we've stayed in this park, and ideally we should be giving a 4 or 4.5 rating however when you're greeted like you have interrupted the evening soapy and it's a struggle to communicate with the reception staff, you have to wonder how they get any repeat business. Hospitality, I think not. I would highly recommend Big4 Dubbo. It is the first time I have ever stayed at a Big4 and was very impressed. You could certainly see, and smell, the cleanliness as soon as you walked in. We stayed for 3 nights with a family of 5 and we had 2 bedrooms in our cabin with a queen bed in the main room and 2 double bunks in the other. Each bedroom had a tv with cable and electric blankets. We had a heater in the bathroom and the main heater in the loungeroom heats the whole cabin. The kitchen has a stove and microwave, sink and all the cutlery and plates that we required. There is a Woolworths and BWS about a 3 minute drive which was perfect. We went to Dubbo to visit the Western Plains Zoo which was so close we could have walked. Just a great location. The staff were friendly and helpfull and there was plenty to do at the Big4. They have a big screen projector for movies in the afternoon, a jumping pillow, BMX track and pool. I would highly recommend staying here for families. I can't really think of any negatives at all....it was close to the main road but we didn't really notice any noise inside the unit. It was very cosy and we had a great stay. Activities for kids. Our villa was very spacious & clean. Loved it, will be recommending this place to everyone. We will definitely stay there again next time we are in Dubbo. The Cabin was not worth it. having travelled from North Queensland staying in cabins and motel's this was the most expensive and the worst value for money. The Fridge is in the same room as the bed only four foot from the foot of the bed and every hour or so it would cut in and make a rattling noise which kept us awake most of the night. I reported it to the office and nothing was done during that day I also reported a dripping tap over the kitchen sink with out filter screens nothing was done with that either. When you turned on the tap the water came out and sprayed all up the window and over the bench top if the screens had been re installed this would not have happened. The last night there I turned the fridge off to get some sleep. Tired but adequate cabins with basic facilities at a nice, tidy conveniently located park. Located very close to the Taronga Western Plains Zoo and perfect location if you are looking for an easy, simple overnight base. Cabins are overpriced relative to the quality/comfort of nearby hotels/motels however could be some value for those needing more than one room. Kids loved the giant jumping pillow and heated pool. safe environment for kids with large jumping pillow, small pool and bmx track. this is the closest accomodation to the zoo (~1km) and has good facilities for young kids. it is clean and comfortable, however would not recommend any cabin that is situated near the highway, (other cabins may be quieter). our cabin was literlly 10 metres for the highway. there was traffic noise (heavy freight) all night keeping us awake. kids room was very hot without a/c or fan. check-in was not freindly, however all other staff were helpful. a/c broke down and was leaking water everywhere. staff came to look within a few minutes, but decided to not fix it while we were there to not get in our way.